In the mid-1960s, with the Revolutionary War Bicentennial looming ahead, a number of military history enthusiasts throughout the East began establishing recreations of units that actually served in that conflict. Among the first handful of these was The Second Pennsylvania Regiment and the 43rd Regiment of Foot. The members wished to portray units that were typical of the troops on both sides and which also had exceptional histories. 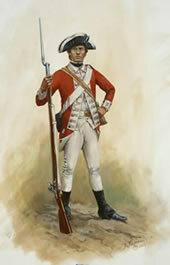 They chose the 43rd of Foot because it was one of the few British units to serve in the colonies for the entire war. The Second Pennsylvania was picked because of its valiant service with Gen. Anthony Wayne and its connection to the region. The unit’s initial focus was primarily on shooting black powder weapons in competitions. However, as the regiment grew the members desired to concentrate more on living history and authenticity than on marksmanship, fueled by fresh and ever-expanding research into the life and material culture of the common soldier of the 18th Century. The leaders of the regiment determined to depict the Revolutionary War soldier with as much realism as possible and took the first faltering steps to translate the research into the object. As the Bicentennial dawned, the unit represented the state-of-the-art of interpreting the soldier and it soon became one of the largest and most honored such organizations in the country. Today The Second Pennsylvania Regiment and Forty Third Regiment of Foot carries on the legacy of leadership and authenticity it established nearly 50 years ago. Additional members are assigned duties by the officers to include such things as recruiting, quartermaster, truck and camp maintenance, marketing and pr, etc. "Rank" is only a role some members play at events and everyone is capable of shaping club policy and impacting its programs. Since we portray an 18th Century military organization, we also have a "chain of command" of officers, sergeants, and corporals that take leadership roles at events. Normally, the president of the club is also the commander and holds the rank of major. Our current organization calls for one major, one captain, one lieutenant, two ensigns, a sergeant major, two sergeants and six to eight corporals. Corporals serve in that rank for three-year terms and are appointed by the officers after consulting with the outgoing group of corporals. There is also a lieutenant and sergeant major in charge of the artillery and a sergeant who oversees the music. A campfollower is selected by the officers of the club to manage the camp activities. When we perform for the public, we generally organize ourselves into two companies, each led by an officer, with a sergeant and two to four corporals. The musicians form their own section on the right of the line. The two ensigns mentioned earlier carry the regimental colors and stand between the two companies. The artillery stands independently. Although we are not a real military organization, our members enjoy "playing the part" and follow the chain of command while in the field to present a more authentic appearance. The regiment encourages the participation of every member. To be considered "active," a member must participate in at least one quarter of the scheduled events each year and be current in dues. Among other things, active members receive authentically prepared meals at events, are covered under the regiment’s insurance policy, have use of tents and camp equipment at events and receive all official communications.